THE QUEEN has recognised five people on the Isle of Wight for their hard work and dedication to a range of charities and organisations. Mrs Gillian Frances BURNETT – receives a BEM for Services to the Community. Mr Ian David WARD – receives a BEM for Services to Community Transport. Mr Glyn ELLIS – receives an MBE for Services to Maritime Safety and the Community. 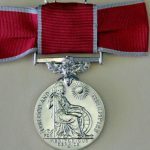 Mrs Alison Linda BEANE – receives an OBE for Services to Education. The full list of honours for 2017 can be found here.